In 1983, farmland still covered much of North Alabama, but a group of visionary businesspeople knew it wouldn’t always be that way. The Huntsville economy nosedived after NASA’s Apollo program closed in the 1970s, and local business leaders knew the city needed to look beyond the federal government to keep their city thriving. The Association has been remarkably successful in fostering a thriving international business community in North Alabama. By 2000, NAITA identified a 300 percent increase in local exports over the previous decade. Since its founding, NAITA has grown to more than 500 members representing more than 150 businesses, manufacturers, service providers and economic development and academic organizations. This fall, NAITA will mark its milestone anniversary with its 35th annual World Trade Day Luncheon Celebration, in conjunction with the 7th annual Alabama Global Supply Chain and Logistics Summit, Nov. 1-2 at the Westin Huntsville. Since its founding, NAITA’s goal has been for North Alabama to be recognized as a center of excellence for international trade, says Anne Burkett, who is a founding member and executive director of NAITA and also director of planning and economic development for the Madison County Commission. The organization works to accomplish that goal by providing international trade advocacy, training and networking to promote economic growth in North Alabama. “NAITA and the Madison County Commission have worked together with regional community leaders to identify issues related to trade that are common to all communities in our region, like infrastructure, business needs, cross cultural communications, workforce development and education — addressing issues that will enable North Alabama to compete with the rest of the world, ” Burkett says. For instance, NAITA works with companies that need information, support, planning assistance and mentoring for their export initiatives to compete in the global marketplace. In partnership with the Export Alabama Alliance — a network of international trade agencies across the state — NAITA organizes international trade seminars on specific overseas markets, free trade agreements and the mechanics of exporting and importing and has hosted nationally sponsored and recognized seminars. NAITA’s work has helped North Alabama companies conduct business successfully around the world and has helped establish the region’s strong identity around the world. With its signature publication, Technology & Innovation of North Alabama, NAITA facilitates global business opportunities by sharing the capabilities of innovative local companies with potential partners around the world. “This global outreach assists small and medium-sized enterprises in making connections, building new partnerships and gaining access to new markets, ” Burkett says. For instance, NAITA has helped initiate global partnerships with Business France; Consortium for Research and Innovation in Aerospace in Quebec and AeroMontreal in Canada; Enterprise Ireland; European Space Agency Business Incubation Center Network; Harwell UK Business Incubation Centre; Indo-American Chamber of Commerce, and the Open Worldwide Innovation Network in Belgium. Earlier this year, NAITA was recognized as a recipient of the 2018 Governor’s Trade Excellence Award, alongside seven successful Alabama exporters. NAITA was the only nonprofit membership organization included in the awards. As NAITA leaders look to the future, they expect to continue forging a path toward stronger international trade opportunities for North Alabama companies. Guided by a board of directors representing industry, economic development groups and service providers, NAITA will continue to focus on the topics that matter to local companies and their global customers and potential customers. • NAITA Conversation on Trade. This annual event provides a forum for government officials to focus on the impact of trade on North Alabama and to provide education on positive trade policy. The 2018 event focused on What Lies Ahead with NAFTA? and featured government officials from Canada and Mexico. • The NAITA Export Control Update. This biannual conference focuses on updates from the U.S. Department of Commerce Bureau of Industry & Security, the U.S. Department of State Office of Defense Trade Controls and other agencies involved in export controls. Featured speakers include representatives from appropriate agencies, as well as professionals from the private sector. • NAITA Trade Compliance Roundtable Series. This series addresses topics related to federal export licensing and compliance and provides a networking forum for company officials charged with this responsibility. • NAITA Foreign Military Sales (FMS) Industry Day with the U.S. Army Security Assistance Command (USASAC). This event provides an update on focus areas for the Combatant Commands, education on the FMS process and concludes with a networking opportunity for businesses to interact with USASAC leaders and program managers. • NAITA annual World Trade Day Celebration. NAITA and the Madison County Commission co-sponsor the World Trade Day Celebration, recognizing the importance of international trade to the local, regional and national economy. At this event, a regional company that exemplifies trade growth and excellence is selected to receive the NAITA Global Trade Award. • NAITA International Trade Leadership Series. ITLS is a series of international trade training sessions held in conjunction with the U.S. Commercial Service, the Alabama Department of Commerce, the Alabama District Export Council and the Alabama International Trade Center. ITLS strives to advance international business skills for North Alabama companies and to provide a broader awareness of the resources available to assist companies in expanding globally. The series is designed for new-to-export and established companies. • NAITA Washington International Trade Leadership Update. The NAITA Washington International Trade Leadership Update introduces NAITA members to international trade resources in preparation for — or expansion of — the next steps in exporting, and provides a forum to meet with key government officials regarding favorable international trade legislation. This event is held in conjunction with the annual regional Federal Update Event in Washington, coordinated by the Huntsville/Madison County Chamber and the Tennessee Valley Region. When AT&T divested its Regional Bell Operating Companies in 1984, engineer and entrepreneur Mark Smith saw an opportunity to supply network equipment to the seven divested companies and also the thousands of independent telephone companies across the United States. He opened Adtran in 1985 to serve this need. Over the decades since, Adtran has become one of North Alabama’s largest employers and exporters. The company provides global communications solutions and works to develop innovative technologies used to create products and services that make communications simpler and more affordable for people everywhere, according to Eddie Midgett, director of international operations and global logistics. “We accomplish this with about 70 percent of our global workforce based in Alabama, ” he says. After quick growth during its first few years, Adtran moved into its 170, 000-square-foot facility in Cummings Research Park in 1992, becoming one of the largest industrial facilities in Madison County. There, the company had the space needed to expand its operations aggressively. Two additional facility expansions followed in response to continued growth. The company now occupies an 80-acre campus with facilities totaling approximately 1.1 million square feet, including 400, 000 square feet dedicated to manufacturing and distribution. At its Huntsville facility, Adtran annually manufactures about a half-million units, including leading edge prototype manufacturing, rapid new product ramping, volume production of printed circuit board assemblies and large scale system integration and configuration. “This flexibility enhances our design and development activities and ultimately leads to better products and another competitive advantage for Adtran, ” Midgett says. During 2017, Adtran’s Alabama factory produced 1, 200 unique products, covering about 75 percent of the company’s entire portfolio. While Adtran has been doing business internationally for decades, over the past 11 years the company has increased global sales significantly. From 2006 to 2017, Adtran’s international business grew from 7 percent to 24 percent, representing almost $160 million of the company’s total $666 million revenue. 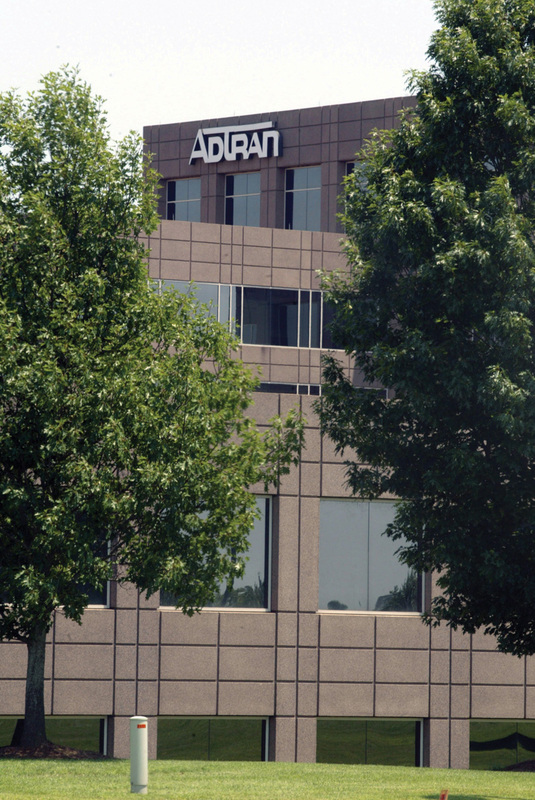 Last year, Adtran sold products and services to customers in 68 countries. As Adtran has expanded its international business, the company has benefited from the programs and expertise available from the North Alabama International Trade Association. Adtran has proven its reputation as a global leader with a number of awards, including the NAITA Global Trade Award, the Governor’s Trade Excellence Award, the Alabama Large Manufacturer of the Year and numerous product awards. 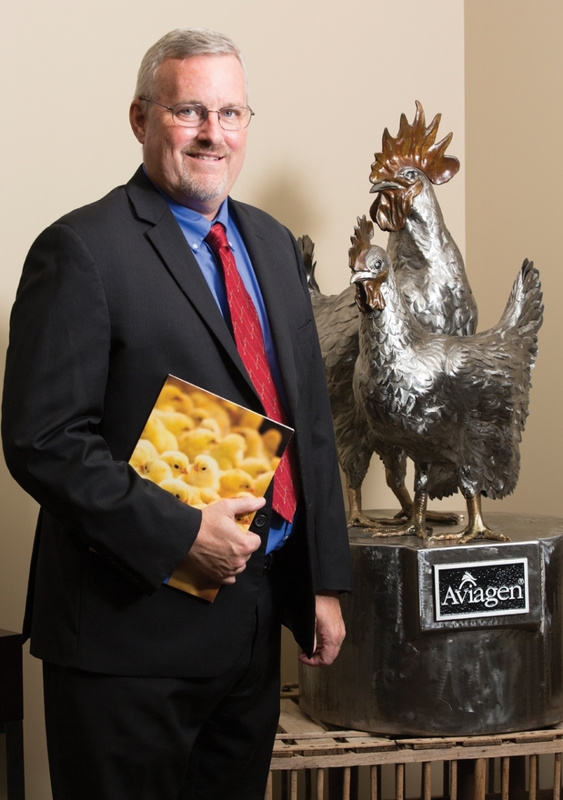 Don Hachen, director of global planning at Aviagen, which supplies chicks to the world. In 1923, two Connecticut farmers used an old discarded piano crate as their first chicken house to produce the Arbor Acres White Rock breed. The Arbor Acres breed of chickens influenced the early poultry industry and grew in popularity, and in 1952 the company opened its first office in Huntsville. Over the years, Arbor Acres acquired and merged with a number of different companies, and from those early roots, Aviagen was formed in 1998. Aviagen is privately owned by the Erich Wesjohann Group, a family-owned holding company based in Germany. But with its deep roots in the American poultry industry, Aviagen has emerged as a multinational company with several brands of breeding stock under its company banner, including Arbor Acres, Indian River, Ross, the Rowan Range and the Specialty Males portfolio. Among these multiple brands, Ross is the product of choice for the U.S. market and is the most popular brand globally, says Don Hachen, director of global planning at Aviagen. Aviagen has come a long way from that makeshift chicken house in a leftover cardboard box. Today, it is the world’s leading poultry breeding company committed to the reliable supply of high-quality, healthy chicks under its various brands, which are sold to customers worldwide. These day-old chicks become the parent stock, which Aviagen customers breed and raise to produce broilers, or meat-producing chickens. For more than 30 years, Aviagen has been selling its day-old chicks to customers around the world, especially in Canada, Mexico, Thailand and Indonesia. Today, Aviagen brands meet the needs of the commercial broiler industry in more than 100 countries. For instance, one order of 40, 000 Aviagen grandparent stock chicks to Indonesia will allow customers to sell 1.6 million parent stock chicks, which will produce 216 million broilers, or nearly 1 billion pounds of processed chicken, Hachen says. The shipments range in value from $15, 000 to $1.3 million. While Aviagen’s global corporate headquarters office is in Huntsville, the company employs about 1, 000 people across the United States in locations including Alabama, Tennessee, Oklahoma, Georgia, South Carolina and New York. “Of these employees, about one-third are dependent on international business, and an estimated 100 jobs have been created within the last 10 years due to international trade, ” Hachen says. 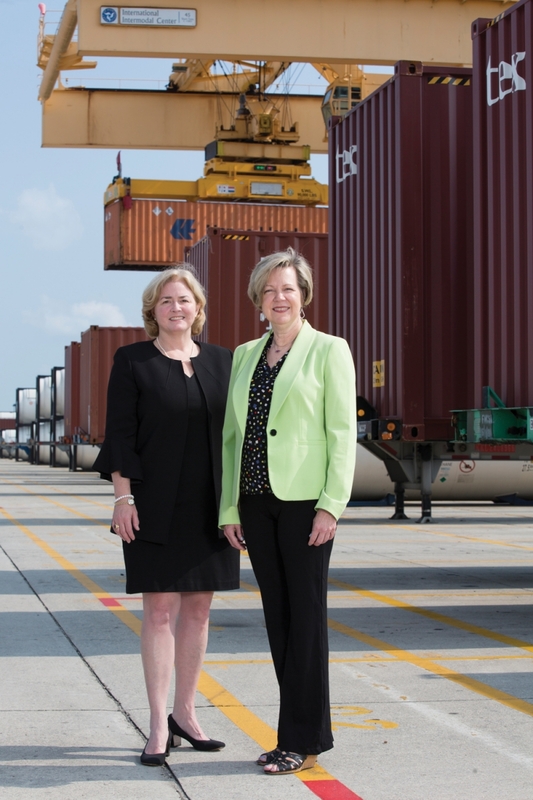 Aviagen has relied on the North Alabama International Trade Association to help train export personnel, as well as for networking with other export companies in the Southeast. These connections have provided valuable resources, such as contacts in foreign consulates and the State of Alabama trade office, which have been helpful in untangling delayed shipments, Hachen says. 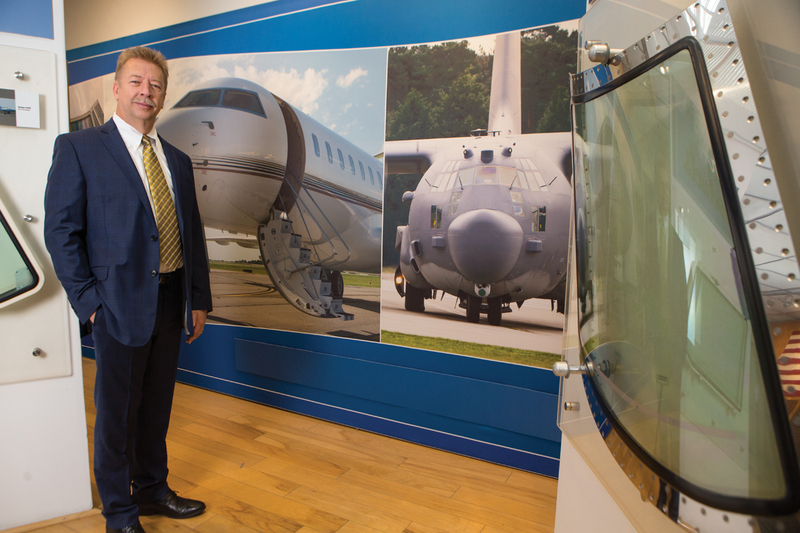 Arthur Scott of PPG Aerospace, which supplies aircraft windows and more worldwide. The PPG Corp. was founded in 1883, but the company first began producing aircraft windows in 1927. Its first aircraft project was producing the windows on the Ford Trimotor, says Arthur Scott, global director, Commercial & Regional Aviation Aerospace Transparencies at PPG. The company opened its Huntsville location in 1969, as the region’s aerospace industry was expanding. Next year, PPG’s Huntsville facility will celebrate its 50th anniversary. The factory continues to produce aircraft windows, including Aircraft Transparencies and Specialty Transparencies. These include cockpit windows for commercial, regional, general aviation and military aircraft and cabin windows mostly for business jets; some lenses, and windows for specialty mining equipment. Some of the company’s unique products include windows with PPG’s Surface Seal® Coating for rain shedding and PPG’s Opticor™ Advanced Transparency Material providing a lightweight, durable material for use in aircraft. Throughout its robust international growth, PPG has been involved in the North Alabama International Trade Association, participating in NAITA-sponsored missions to other countries and benefiting from NAITA presentations focused on concerns and barriers to continued growth, Scott says. 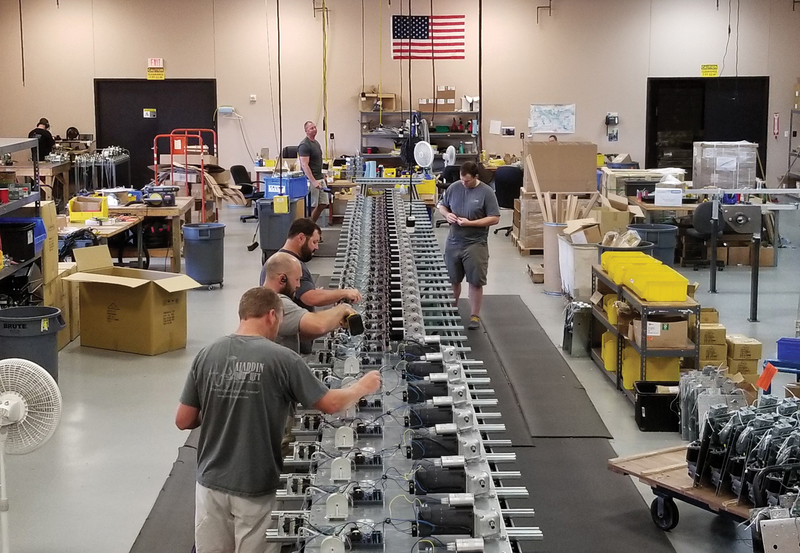 In the first step toward building a light lift system, technicians at Aladdin Light Lift wire switches and tighten base plates to channel struts. From top are Jason McAlister, Seth Logan, Bryant Deaver, Zachary Jensen and Adam Bryant. John and Susan Falls of Memphis founded Aladdin Light Lift in 1990 and opened the company’s Huntsville facility in 2012. Aladdin produces an electric motor and winch system designed to raise and lower decorative lighting. Looking to the future, Aladdin Light Lift plans to continue its current effort to open two new international destinations for its products each year. Within the next five years, leaders hope to see their exports reach 12 percent of the company’s total revenue. Located in Florence, Applied Chemical Technology (ACT) was founded in 1981 as a small engineering firm focused on developing and commercializing technology in the fertilizer industry. Almost four decades later, the company has grown into a multi-disciplined engineering firm that serves a number of industries including fertilizer, specialty chemical, biofuels, animal feed and mining. About 20 percent of ACT’s annual revenue comes from international customers, so leaders are focused on continually learning about changes in global trade. The resources available through NAITA have been “extremely beneficial” for ACT and other small companies working “to navigate the ever-changing rules, regulations and tariffs in our global economy, ” McGill says. ACT leaders recognize that continuing to foster international growth is important to remaining competitive and continuing to grow as a company, McGill says. The company is doing this by attending trade shows, investing in visiting customers in international markets, as well as equipping employees with resources necessary to work internationally, including foreign languages and training. For almost 36 years, STI Electronics has been serving as a contract manufacturer, providing manufacturing services to its customers, both domestic and international. The company specializes in manufacturing specialty, high-density assemblies for military and aerospace applications. STI also offers analytical lab services including full materials, construction and failure analysis. The firm is an approved IPC Training Center with a full range of solder training kits and dummy components. For instance, STI sells its full line of process and solder/assembly kits to customers in the United States and around the world. “We also provide education and training classes to various international companies, as well as provide consulting and analytical lab services, ” Bradford says. Always looking for new markets, STI aims to continue building its international business. Currently, the company is initiating new marketing efforts to expand its services and products into additional international markets. 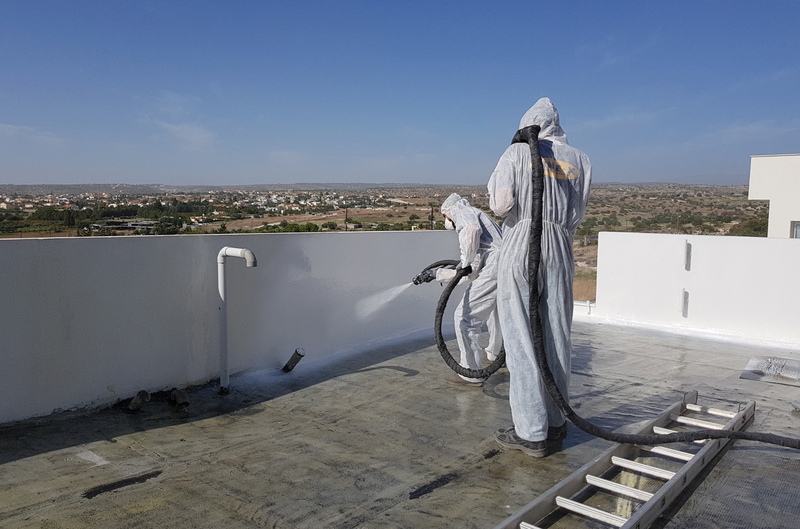 Instead of resurfacing with another traditional roofing material, a high-performance polyurea coating from LINE-X was applied to create a seamless waterproof membrane for a flat roof in Cyprus. The fast dry-time allowed for a very fast turn-around. Founded in California in 1993, Line-X relocated to Huntsville in 2009. The company is the aftermarket leader in high-performance polyurea protective coatings and truck accessories, most widely known for spray-on truck bedliners. In addition to lining the beds of pickup trucks across Alabama and around the world, Line-X’s coatings have also been used to protect military vehicles and troops, vehicle exteriors and manufacturing and industrial projects of all varieties, says Dennis Weese, president of the company. Now at home in Huntsville, Line-X has made significant investments in its corporate headquarters. “We recently celebrated one year in a new 60, 000-square-foot facility in Jetplex Industrial Park that houses a state-of-the-art product innovation lab, a hands-on training facility and a support staff of over 70, including an award-winning chemistry team and international shipping department, ” Weese says. In recent years, Line-X has expanded its product and service offering to support original equipment manufacturers and industrial applications in the United States and overseas. Prominent applications include van lining, specialty vehicles, secondary containment, construction, military and marine coatings. Today, Line-X supports more than 660 customers and franchisees in 75 countries. Since moving to Huntsville, the company’s international presence has increased 36 percent. “International business is vital to our plan for growth, ” Weese says. International sales represent almost 22 percent of Line-X chemical sales, more than 15 percent growth since 2012. Line-X has placed greater emphasis on international operations in recent years with special focus on increasing product and technical support to Canada, Europe and Mexico. We also are looking to expand our product portfolio through our distributors in Asia. Founded by longtime North Alabama meteorologist Bob Baron in 1988, Baron Services focuses on delivering critical weather intelligence to its customers. Over the years, Baron has designed, developed, installed, upgraded and refurbished various weather radars that are used by government and commercial customers. When severe weather threatens, accurate, real-time information can be lifesaving. With 20 years of experience developing products that reliably predict and inform people of weather changes and movements, Baron allows its customers to provide that lifesaving information when needed. Baron’s services include weather radar, visualization software, hydrological and roadway modeling, digital solutions and value-added weather data through multiple distribution channels. For instance, some of the organizations using Baron visualization software, modeling and weather data in their own products and services include ABC, CBS, FOX, NBC, Verizon Network Fleet, Sirius XM, AccuWeather and others. All of Baron’s products are backed up by the firm’s Huntsville staff of about 100 employees. On-site engineers and meteorologists provide round-the-clock support. With its complete solution for weather radar systems, data integration and weather prediction modeling, Baron has long attracted the attention of international governments and companies, says Bob Baron Jr., executive vice president and chief products officer. The company completed its first international project, a radar system for Paraguay Aviation, about 15 years ago. Since then, it has had significant international success. Over the next few years, Baron Services expects to see its domestic business continue to grow, and its international business to expand from 10 percent to 30 percent of its total revenue, Baron says. Founded in 2008 in Atlanta, Yorktown Systems Group (YGS) relocated to Huntsville in 2009 to be closer to its government customers. Since then, the professional services company has grown from about five employees to about 650 employees across the United States and internationally, including 120 employees in Huntsville. The company provides training, operations, administrative support, language and culture administration and modeling services for federal government customers. While Yorktown’s customers are not international, over the past two years it has started to conduct much of its work for the U.S. government internationally. For instance, YGS regularly provides “live environment training” in 13 countries, among them China and Panama. This includes taking customers, such as military leaders, through an immersive language and culture-training program for a couple of weeks to a month, says Bryan Dyer, CEO of Yorktown Systems Group. In addition to helping participants understand the local culture and develop language abilities, YGS also manages visa requirements, travel coordination and other necessary services.